Derived from the French, and meaning mono or single layer, the monocouche render systems that we install are the new generation of modern single coat renders which can be applied by hand or machine. Colour pigmented throughout, meaning no house painting, monocouche renders provide a low maintenance, weather resistant, hard wearing and attractive finish to a large range of external brick and blockwork properties. 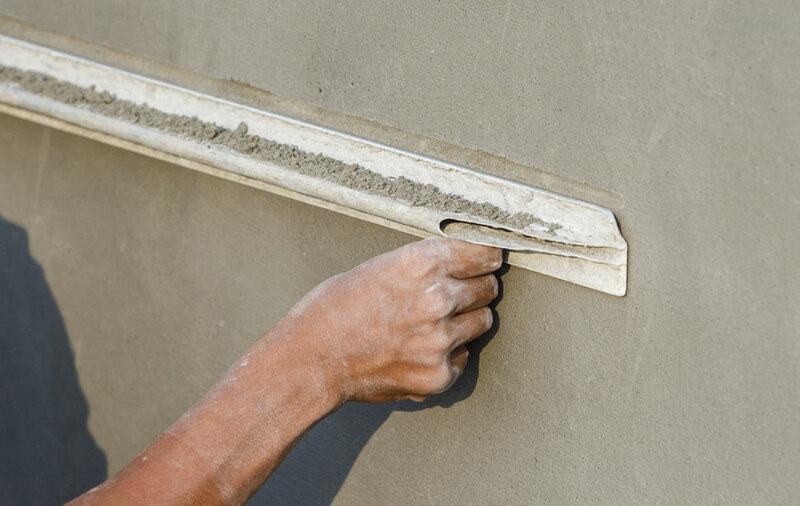 Monocouche render products are available from a number of different companies. The monocouche render system preferred by Hillier Marsden is Weber Pral M. A market leader in the production of high quality single coat renders, and available in over 20 different colours. This high quality, competitively priced monocouche rendering product provides for a fast single coat application by hand or by machine. Weber Pral M requires just the addition of water on site. The product is rated A+ in the Green Guide rating, is BBA approved (certificate no 05/4268), and moisture and algae resistant. Standard monocouche render thickness is normally around 15mm, but can be increased to 28mm on double application, should it be required. Monocouche Render Systems can Save You Money! As with all things, good effective preparation is the key to a professional job. The state of your building’s exterior, and the level of work required to prepare it for rendering will obviously have a bearing on cost. In some instances, where the exterior already has a good mechanical key for rendering, preparation will be minimal. In others, where keying aids have to be applied, preparation will take a little longer. That said, Hillier Marsden’s monocouche render installers have years of experience in the building industry. Whatever the preparation period, time can be saved using monocouche rendering. Compared to traditional renders, monocouche rendering can be applied quickly and professionally through its spray system. This reduces the cost of additional equipment on site, such as scaffolding. If you are considering a major residential property development, or you just want to give your home a little more curb appeal, contact Hillier Marsden today. We have brightened up hundreds of properties around Surrey and the surrounding areas with our high quality monocouche render systems. We would be pleased to discuss your requirements, and provide you a portfolio of completed works.